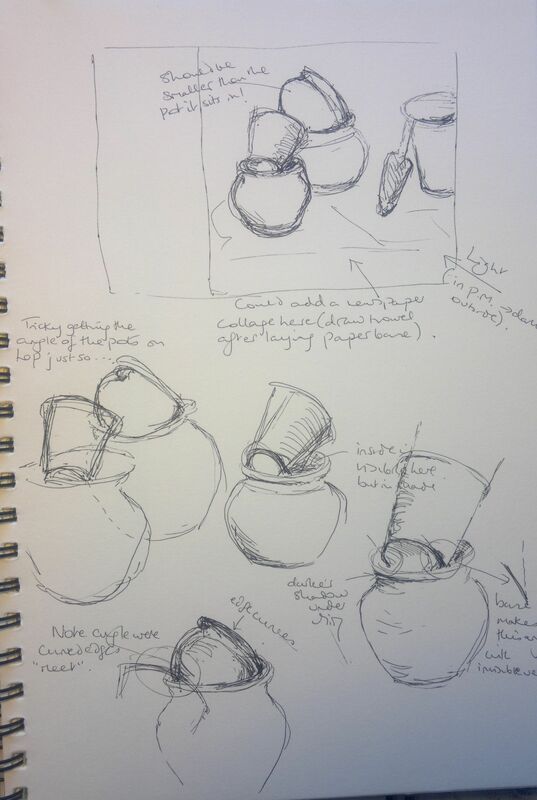 I should have drawn the made objects first drew the natural objects instead… so this entry documents the process as it was carried out. I selected vegetables as natural objects for a still life and wanted to include onions and garlic because I like the papery quality of their outer skins and had them in the kitchen… The approximately spherical shape of most of the vegetable (two shallots and a tomato) produced a repeated shape to which the half used garlic head and single clove provided a contrast. 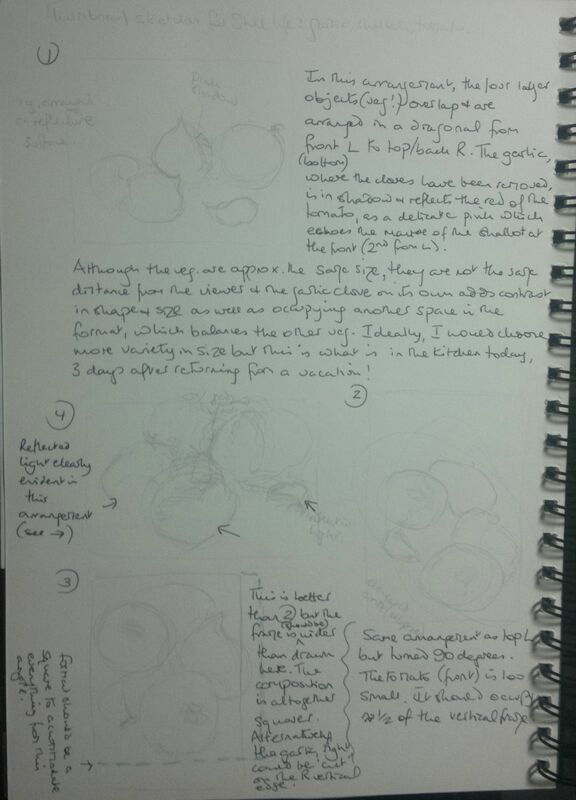 I sketched four thumbnails before opting for one, the fourth one, for a larger drawing on A2 paper. I liked the first arrangement because the tomato and one of the shallots and the garlic formed a diagonal across the format. The garlic clove was separate from the other veg, balancing them visually. However, I finally selected the last arrangement because the reflected light was clearly in evidence.One appealing aspect of the choice of vegetables was the rosy shadow of the tomato which was visible through the papery external layer of the garlic bulb. It would have made a good colour study. I probably would not have noticed this a few weeks ago! The next stage was to draw a larger sketch of the chosen thumbnail and consider where highlights, cast shadow and reflected light would fall. I had arranged them on a shiny tray in order to make it easier to discern the cast shadow. I also intended to use the rim of the tray to identify the negative space; however, in the final drawing, I ignored the tray and focused on the vegetables. I did not realise this until after I had finished drawing and opted not to include it at this stage. 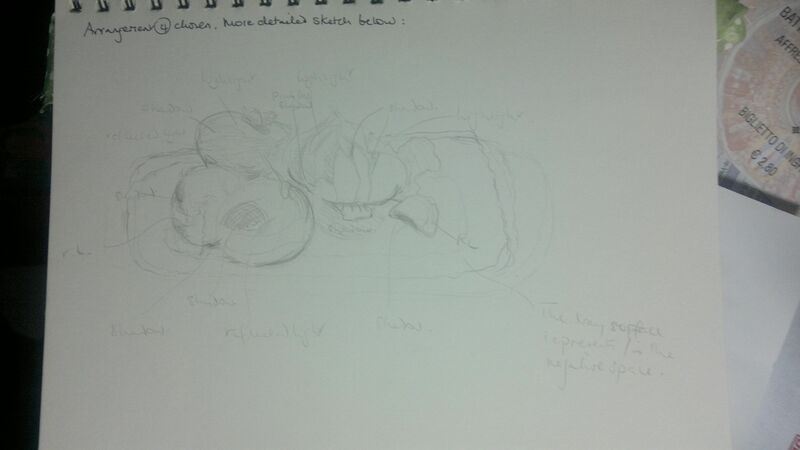 The final drawing is on A2 paper but the space occupied by the vegetables on the paper is no larger than A4; however, the image is quite different when viewed against the A2 paper compared with viewing it inside an A4 frame. Although most of the paper is only a gray background, it is not uniform (I applied a background of graphite powder and had difficulty in applying this uniformly and so the surface is smeared in places…. 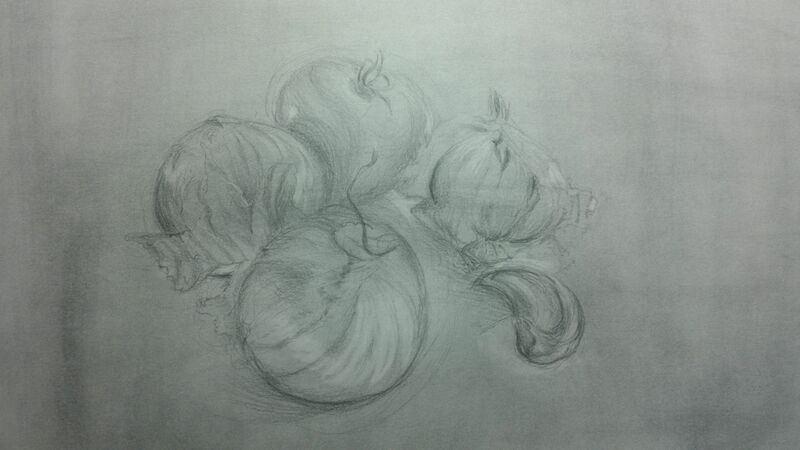 I had thought of cutting out the image to stick into my sketchbook but this creates a totally different drawing… Suddenly the vegetables are supersize whereas, on the A2 paper, even though the drawing itself is larger than lifesize, they seem smaller against the graphite desert of the paper. 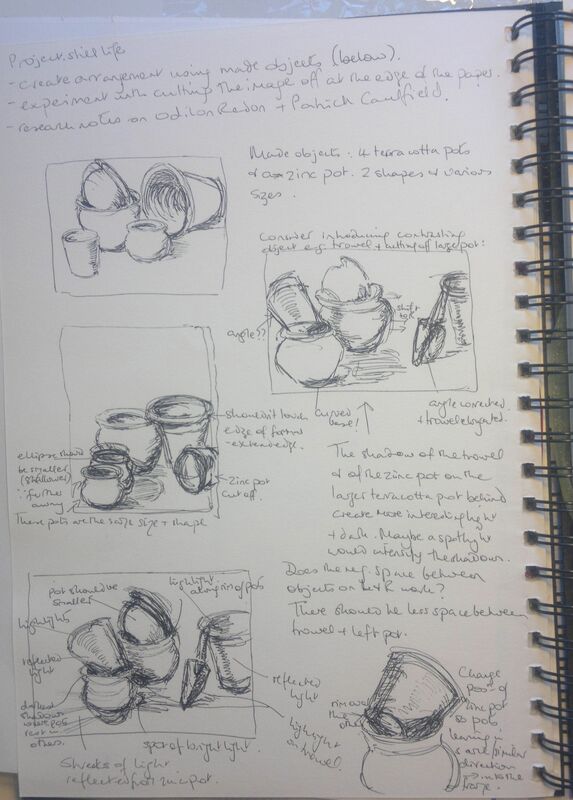 The light changed during the course of the drawing, and the final patterns of light (at about 7 pm) on the surface were slightly different from those present when I drew the thumbnails (at about 1.30 pm). I have photographed the final drawing at short-range in order to produce enough detail. I produced darkest shadows with a 2B and 8B pencil; highlights and reflected light were drawn with a putty eraser formed into a point or edge. i could have improved the shadow on the surface of the tomato (back, centre) which is visible as a series of curved lines rather than delicate hatching! The highlight on the shallot at the front is not very clear in the photograph – it curves around the shallot from the right hand side to its front – it is clearer on the original. The drawing took 1 1/2 to 2 hours. Exact time uncertain because it was drawn in stages through an afternoon. Another time, I would select objects of different size; although the repeated shape works, the repeated size is a bit boring but the “square” or diamond arrangement of the four main veggies is fluid and the eye is drawn around easily from one to the next. The next still life will experiment with severing the image at the edge of the page. pot met the lower one. The semi-ellipses of their half-concealed bases were at different angles and this also required several sketches to work out (see the second sketchbook page, above). 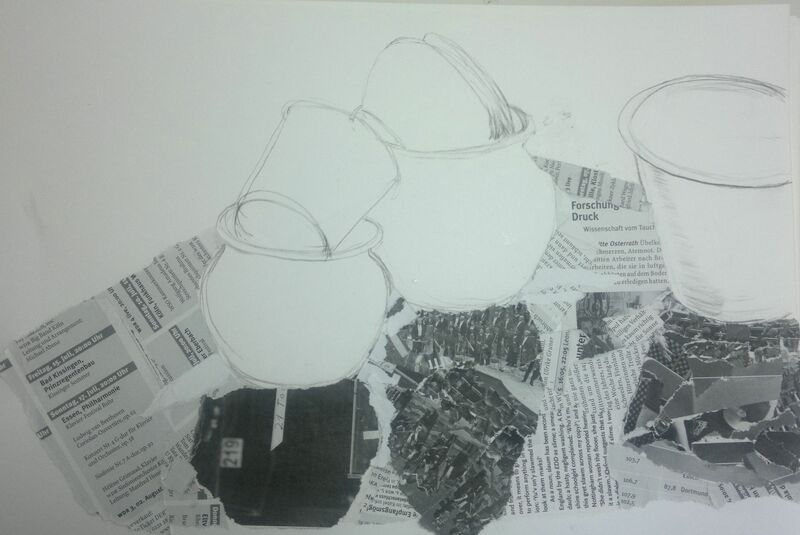 I then sketched the pots on A3 paper and decided to add newspaper as a collage element. The image below shows the drawing at the collaged stage. I attempted to add shadows and highlights as collage elements, too, using quite small pieces of paper of darker or paler grey, or white, accordingly. The next stage was to complete the drawing. I had decided to use charcoal and filled out the body of the objects with black pigment applied with cotton wool and a cotton bud. I then worked from right to left across the paper (I am left-handed) with soft, medium and hard charcoal pencils to create form. Finally, I added highlights with an eraser. A recurring problem that I have is planning a drawing under one set of lighting conditions and carrying out the drawing under different ones. This is “only” an issue when relying on daylight but is a significant challenge. 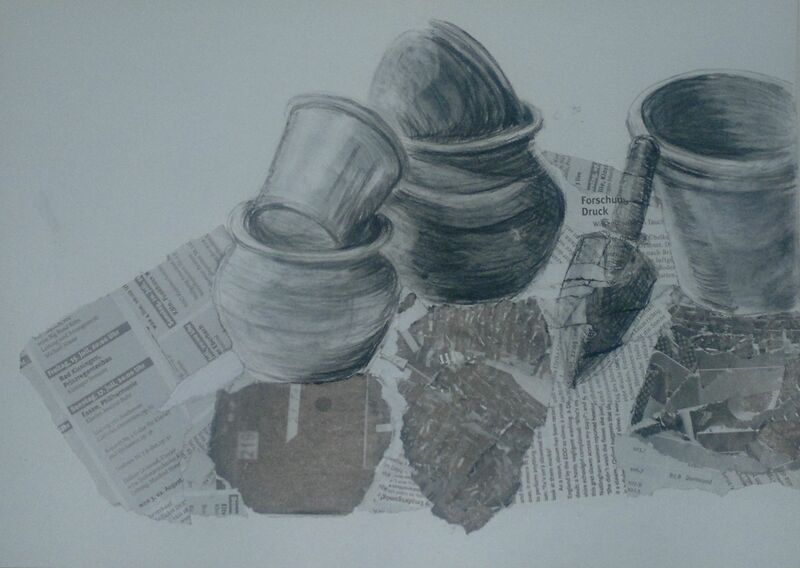 In this drawing, the shadows were introduced as if the light source were directly in front of the viewer and behind the pots. By the time the drawing was underway, the dominant light source was a window off to the left of the objects. In these exercises, I found the natural objects easier to draw three dimensionally because it was easier to see the subtle changes in light on their surfaces. Most of the pots that I used had a rough surface and small areas of reflected light were hard to spot. This was made easier when light bounced off a reflective surface, such as from the “mouth” of the zinc flower pot on to the base of the terracotta pot sitting in the larger pot directly behind. I created a sense of solidity by trying to avoid sudden changes in tone, which does not often occur unless a light source is suddenly cut off. 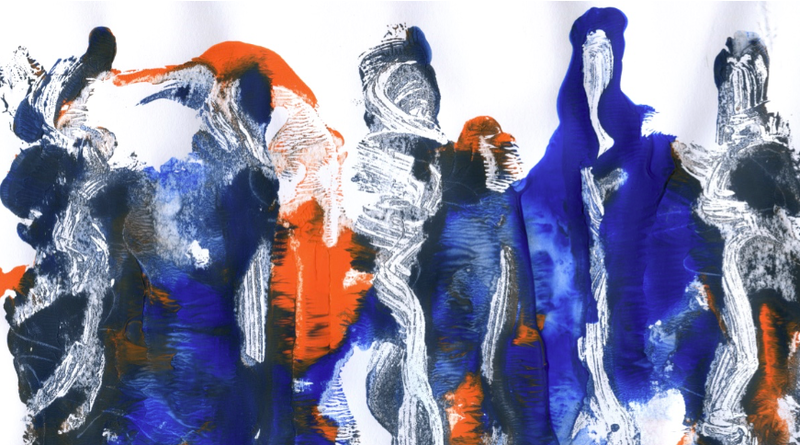 I am not sure that changing the arrangement of the composition made a difference to the approach except in so far as certain arrangements made it easier to identify areas of reflected light or of cast shadow. Knowing where these are likely to fall greatly helps in looking for – and finding – them! I changed the position of the objects in the still life of made objects but changed my own position as well in the natural objects’ arrangement. Deciding how to position oneself is a question partly of the way in which the light is falling at that moment – or how an artificial light source can be manipulated – but is also a question of fluidity of composition (for example, does the eye remain in the format or wander out of it? ), and the arrangement of objects in relation to each other in terms of their characteristics, such as shape or size. Colour relationships would also be important if colour were being used.